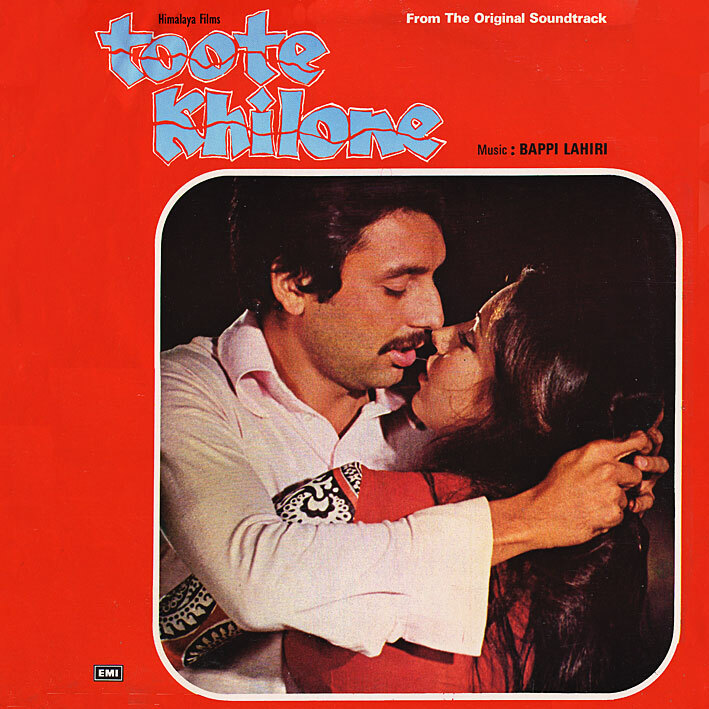 Another pre disco-era Bappi Lahiri offering, chock-full of good tracks: 'Maana Ho Tum' is a nice, slightly Morricone-tinged lounge number, 'Kya Jane Yeh Duniya Kya Jane" (best track, arguably) has a great Lalo Schifrin type intro and a whole bunch of cool instrumental details (including one reminiscent of Sun Ra's 'Space Is The Place' - how awesome is that?!? ), 'Nanha Sa Panchhi' (the happy one) is nice and dreamy, 'Doob Raha Hai Mera Dil' is a lovely Lata Mangeshkar number (with a surprising bouncy middle break), and 'Bandham Kat Gaye' is moogs and assorted weirdness. I'm not a huge Bappi fan so I've not listened to that many of his scores - but I wouldn't be at all surprised if 'Toote Khilone' is among his very best. I remember Maana Ho Tum was a huge hit when this movie was released. Shekar Kapur (director of Elizabeth and Bandit Queen among others) played the lead with Shabana Azmi. He looks so young in the album cover! You are doing a wonderful service to all of us hindi film music fans. Thank you and wish you all the best. The Flicker page isn't loading. I'm hoping it's temporary. Temporary in the sense until I fix the misspelled (again!) URL. Which I now have. ps. You'd have been able to access the page from the 'gallery' link on the right though. That's what I did! I went right to the gallery. I'm not much of a Bappi fan either, but pre-disco seems like it might be good :-) Thanks! yeh mera pahela d/l haiaapke blog se, maine saal bhar pahle bhi try maara tha, tab saare links delete kar diye gaye. Lekin aapne fir se upload kiye hai saare songs. Main aapka tah dilse Abhaari hoon! You're just great! Hey do you hv songs from the film Maine pyaar kiya, its has got some nice romantic tunes, must include that in your blog. Cheers! and loads of thanks! Hey i had a question i wanted to ask here since i couldn't find an e-mail, but i was just wondering if you recognize the music playing in the background of this clip. It's supposedly from a 70's Bollywood soundtrack but i still haven't been able to find it yet, so thanks a lot if you can check it! I've heard it, I'm pretty sure I have it... but can't for the life of me place it at the moment. Anyone? Who is it that's sampling it? PC and DJ Carlito thanks for checking it out! I've been looking around for a while now to find the original song playing in the background, it was sampled since the Charles Manson quote was added at the end. Oh and i forgot to mention last time - nice site, thanks for all the soundtracks might grab a few later! I renewed my acquaintance with some old favourites and am taking a trip down memory lane with all these marvellous uploads. The warmth of vinyl is something I love going back to, and these are just priceless. PC, thanks for your lovely uploads. I have been a great fan of your site for long and not a day passes without my checking it and reading all the wonderfu (and knowledgeable) comments. Thanks once again. Joe, the music clip provided by you has traces of Rafi-Lata duet from Upaasna (1971) - Aao Tumhen Main Pyar Sikhadoon. Music by Kalyanji-Anandji. Lyrics - Indeevar. The movie starred Feroz Khan, Mumtaz, and Sanjay Khan. thanks for the all the albums you have uploaded have been a fan of you site for long time and i check it every day.keep it up. I have a question for you.Do you have any more pakistani LPs? If you do please can you upload them because it is so difficult to get hold of OST recording of pakistani songs,because over the years alot of songs got rubbish Jhankar music added on to them which looses the originality. No, afraid not. I realize there's lots of Pakistani gold out there, but I had to put some sort of limit to my collecting so as to not go totally overboard. Plus the Pakistani one's are harder to come by. Thank you very much PC. Like i told you in another comment i'm fond of Bhappi Lahiri. Since 15 years i mix some of his songs. Icreate a new myspace page. A dj page. On line you can hear the mix and in the playliste the link to bhappi Lahiri go to your page. It's the best hommage for B L perhaps. But if you don't want , tell me and kill (i don't know the word, took up?) the link. PC... you are a KING! bahut shukria! I've only just stumbled upon this blog a week ago and am obsessed with it. I have a few OG presses of some albums i've not seen up here, from when my parents were living in the region. I'll have to rip them and send them off to you when I can get some spare time. Thanks very much, I am enamoured of Indian music, folk, classical - pop and filmi as long as it's at least 20 years old, I like the quirkiness of this stuff as a musician and they don't seem to be making them like they used to. Thanks for all of this work to do this, and I await your return. How can I download songs from this link? Mana Ho Tum was one of Bappi's finest numbers, and never fails to remind us that there will never be another Yesudas. A beautiful soundtrack. It's not often that I like a song the first time I hear it, but Nanha Sa Panchhi knocked me out. Wonderful! Thank you so much. Superfunky tune on this great OST. Thanks! You should look for this Bappi album calle Paapi (1977) - quite nice songs there. I have a sort of okay Vinyl rip of a few of the songs if you are interested. Songs/videos are on YouTube.